Next time you have a coconut based curry, why not whip up this delicious Thai coconut ice cream as a dessert? Serve with a caramel sauce for extra indulgence. I have fond memories of my trip to Thailand a few years ago. We did a week long holiday in Bangkok and Pattaya, relaxing on the pristine white sandy beaches, taking scuba diving lessons, visiting the gorgeous temples, and of course, the most interesting bit about any holiday for me, the food. From street side small eateries to markets to restaurants to bars, we tried it all. The food was simply fabulous, and nothing like I've had elsewhere. I have tried to recreate many a dishes from my Thailand holiday, hitting the right note on a lot of them, but failing to get the taste right on a few others. Of course, the Thai green and red curries are a staple at mine, and although I haven't perfected the Pad Thai, it tops the list of my must have dishes at a Thai restaurant. Coconut is used in abundance in Thai cooking and coming from the Southern-most state of India, Kerala, I'm not averse to the use of coconut in excess. From the land of coconut curries, soufflés and desserts, coconut ice cream didn't come as a surprise to me. It's a delicious one that can be whipped up in no time, and with very few ingredients. A lot of you might be easily put off by the coconut flavour in an ice cream, but trust me, this recipe is a fine balance of coconut and cream, without either of them overpowering, yet the subtle taste of coconut coming through. The desiccated coconut adds some texture to the creaminess and works brilliantly. 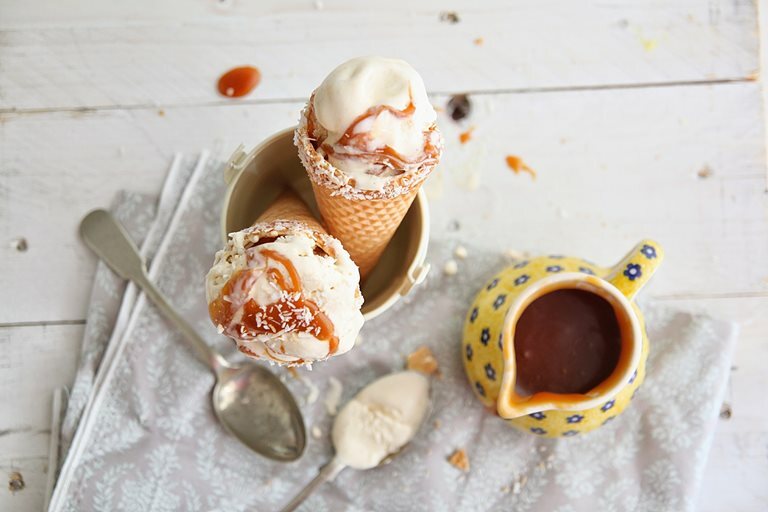 The ice cream is not really sweet, so a generous drizzle of caramel sauce does no harm to the outcome. 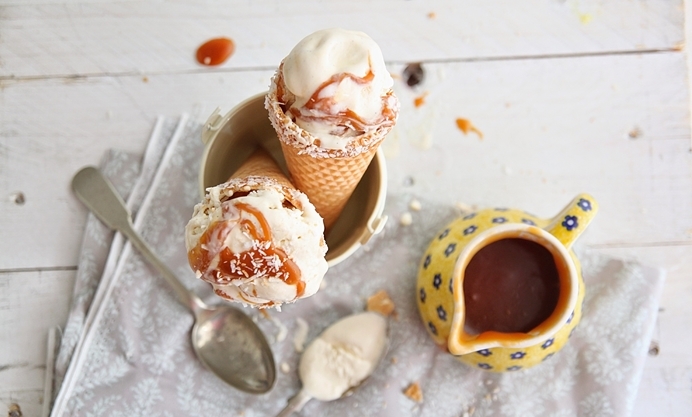 It lifts the flavours a tad more, and anyway put warm caramel on anything and you can't go wrong! The recipe can be easily halved, using 2 egg yolks and double cream can be replaced with single cream too, if you needed to get rid of some from your fridge. I used coconut milk from a can, which was pretty thick, so if using coconut cream then dilute it with a little bit of water to make 150 ml. Of course, if you did want the coconut flavour to come through more aggressively then increase it to around 200 ml and reduce the cream quantities accordingly. It's a pretty forgiving recipe and you really can't go wrong with it. Serve in mini waffle cones, if desired.